KMUW Music is celebrating Valentine's Day with five hours of music on Thursday, February 14. Join Global Village, Strange Currency and Night Train from 7 p.m. to midnight. 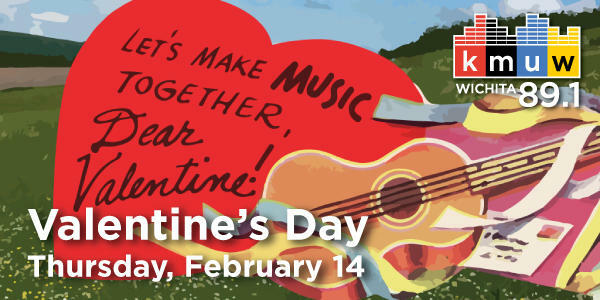 It’s hearts and flowers in the Global Village, as we celebrate Valentine’s Day with love songs from around the world. Hear music from Bob Marley & the Wailers, Cuba’s Los Zafiros, South Africa’s Mahotella Queens, Brazil’s Astrud Gilberto and more. Strange Currency's annual Valentine’s Day special features selections from Nina Simone, Ray Charles, M Ward, The Cure and Billy Bragg. Night Train joins in the celebration with a show devoted to songs of the heart. Highlights include selections from Chet Baker, Nina Simone, Shirley Horn, Etta James, John Coltrane with Johnny Hartman, Karrin Allyson (revisiting Coltrane’s Ballads album) and Ella Fitzgerald with Louis Armstrong. It’s also the birthday of saxophonist Maceo Parker (of James Brown’s JB Horns fame) and trombonist Rob McConnell, so the show highlights the romantic side of their work as well. Global Village | 7:00 - 8:00 p.m. Strange Currency | 8:00 - 10:00 p.m.
Night Train | 10:00 p.m. - 12:00 a.m.